Developed by a team of scientists and engineers from MIT, Wristify is a thermoelectric bracelet that can increase the whole-body thermal comfort by providing tailored pulses of hot or cold waveforms to the wrist. The invention is based on the fact that by heating or cooling parts of the skin we can influence how hot or cold we feel over the entire body – just think of cooling down a fever by using cool flannels, or warming up simply by holding pocket warmers in your hands. Basically, feeling hot or cold depends as much on our perception as it does on external factors, such as the actual temperature in our environment. By acting on perception through the use of “thermal-pulses”, this wearable copper-alloy heat-sink adjusts body temperature to a comfortable state. The idea is that if we are able to give our body the sensation of thermal comfort, we can avoid spending money and resources warming up or cooling down whole buildings. 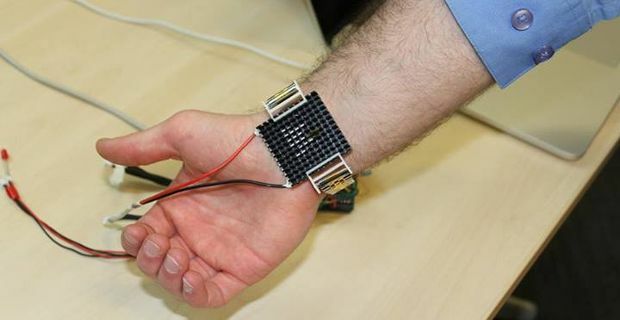 A thermal device that can be worn like a watch, able to automatically measure body temperature and then make the required adjustments, does exactly this. Additionally, Wristify provides a solution to the kind of problem where one person feels too hot and another too cold. In the future, each person could be able to determine his/her own ideal body temperature, independently by the actual, external physical conditions. The potential impact of the invention on society and the environment in huge. Indeed, in recognition of their invention, last month the Wristify team was awarded the first prize at MIT Making and Design Materials Engineering Competition, bringing home $10,000 (£6200) to finance their project. Find out more about heating systems here and here.